Siralim has always been a complex game, and with these complexities comes a major hurdle for me as a game developer: designing a user interface that provides players with adequate information to play the game to its fullest potential while maintaining ease-of-use. 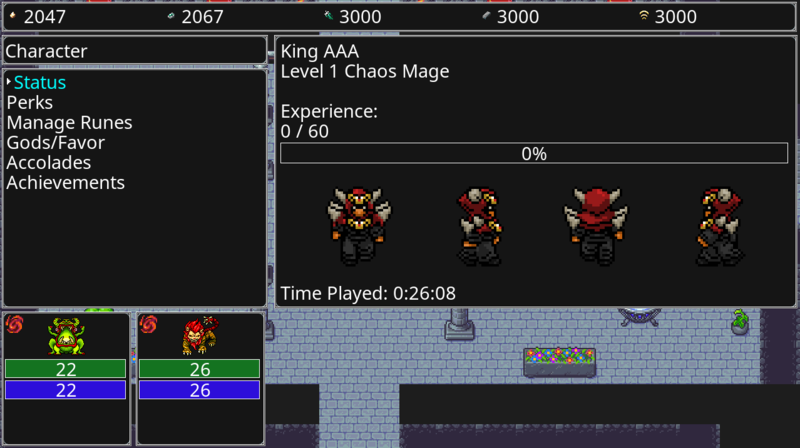 It’s taken me some practice, but thankfully, Siralim 3 has a much more accessible user interface than its predecessors. I’ll start by saying that no single user interface is going to make everyone happy, especially with a game like Siralim. We need to keep in mind that players of all ages and gaming experiences will try this game (you’d be surprised at how many players are over the age of 60), so while you might want the informational equivalent of a Wiki available to you at every point in the game, I don’t think that’s necessarily what Siralim needs. There must be a balance to provide players with as much information as possible, but it has to be presented in a way that isn’t overwhelming. That’s why, for example, I will never add access to the game’s library to the battle menu. There’s always going to be a more elegant solution instead of that – one of which you’ll find toward the bottom of this post. The goal of any user interface designer is to minimize the number of “nested menus” that players need to sort through in order to get where they want to be. 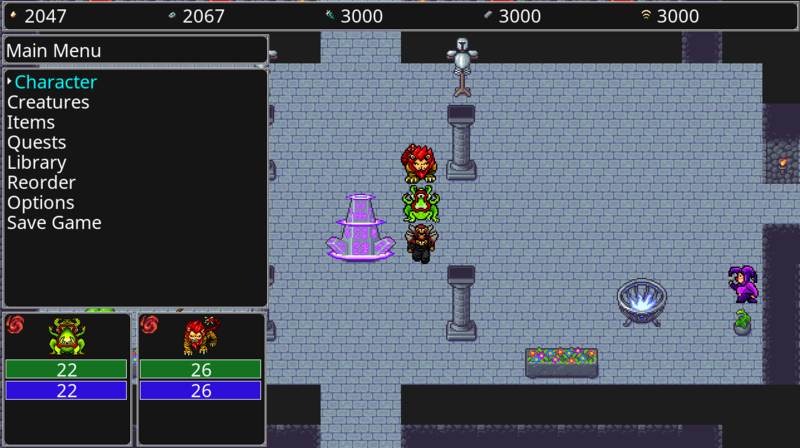 For example, how many buttons do you need to press to equip a creature with an artifact? How many buttons do you need to press to attack an enemy in battle? For obvious reasons, the fewer times a player needs to press a button, the better. Aesthetically, I still want to maintain the old-school NES/SNES user interface style of a black background with white text. After all, Siralim is meant to remind you of those games. I don’t think it’s appropriate for a classic-inspired game to have a decorated interface for no apparent reason. So no, there still won’t be any scantily clad succubi peeking out from behind your creatures’ health bars like you’ll find in a game like Diablo 3. It’s just not that kind of game. Let’s start with the very first screen you’ll see when you start the game and get past the Thylacine Studios logo. I know, it doesn’t take a genius to figure out such a simple control scheme, but isn’t this infinitely better-looking than the primitive white-on-black screens found in Siralim and Siralim 2? This is the first game element that any player sees, and I think the old one had an immediate, negative psychological effect on a lot of players that made them say to themselves, “Damn, this game is cheaply made”. The biggest change to the user interface is the main in-game menu, so we’ll discuss that next. Let’s take a look at a few screenshots. 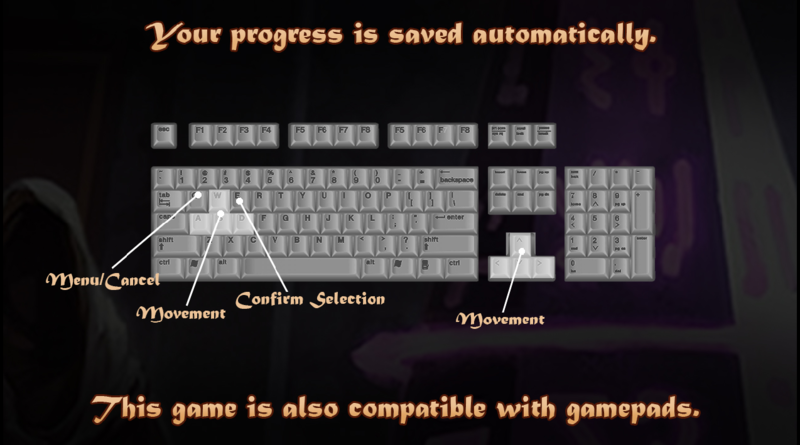 Immediately, with one less press of the button than before, you have some quick access to your character’s information. You can scroll up and down using the W and S keys as before, but you don’t have to press E again – the panels on the right simply change as you “hover over” one of the menu options. The Library interface is now sorted much better as well. Now, each library book has been categorized as either a “List” or a “Guide”. Lists include things like the creature bestiary, the spells you’ve discovered, and your breeding recipes. Guides are informational and serve as a reminder of how certain game mechanics work. This new feature allows you to view the stats, traits (yes, even the temporary ones you can sometimes acquire mid-battle), artifacts, spell gems, and many other things about any creature in battle. You’ll also notice that when I targeted the Yeti, there’s a + next to the “Inspect” text. This means that, since the Berserker Fiend (Chaos) is inspecting the Chillbreeze Yeti (Sorcery), it’ll deal extra damage to it. There’s a + next to all the command text, including attacking and casting spells. That way, it’ll be easier for you to choose the best target based on the enemy’s class. Similarly, you’ll see a “-” sign next to the text if your creature’s attack will deal less damage due to a class weakness. Hi Zack, I might be the only one who asks of this, and it is a bit of a tall order with 700 creatures, but could you add creature lore? Y’know, like a pokedex description, but Siralimized? I think it would be cool to see even a bit of creature lore in the creature menu, like where it came from, what it preys on, and all that jazz. Yep! Umaro is going to write it.